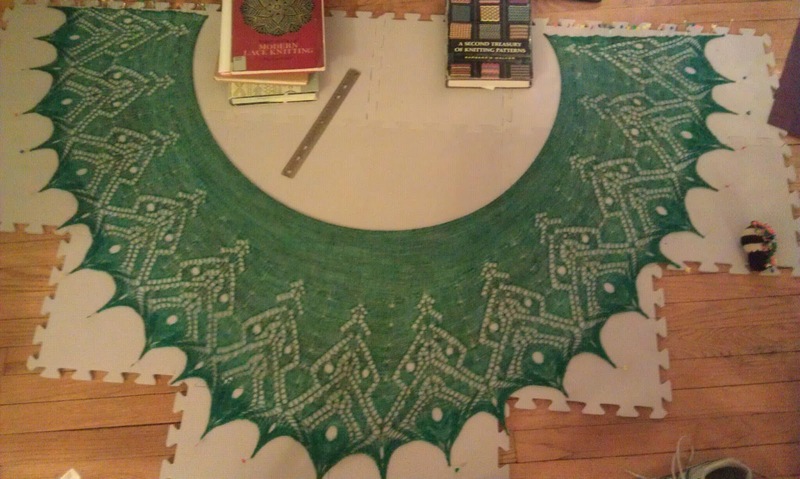 So excited for another SusannaIC Mystery KAL! The first clue was released in early Jan, 2013 and continued through March. The details were available in December so I knew that I would need MANY beads and ~800 yards for this shawl. I selected Madelinetosh Prairie in Turquoise (started with 122 g.) Enjoy watching the project unfold with me as I work through the clues. I hemmed and hawed about removing repeats vs changing needle sizes to conserve yardage for a while. I had yarn that would work great for the small version, but when I was ordering yarn for this project I didn't know that there was a small option for this KAL. Oh well. 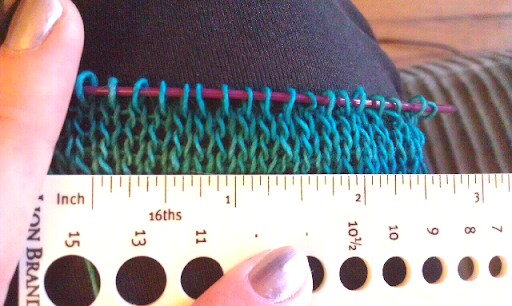 I think I am going to remove 2 repeats (17*2 sts) from the CO edge. This should definitely leave me with enough yarn to complete the project, which still making the shawl a bit larger than a shawlette. Since there are so many beads in this project, I did not want to use the dental floss method to add them to my knitting. 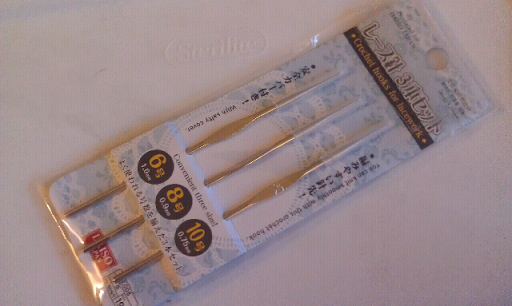 I decided to purchase some tiny crochet hooks to help with adding the beads. I am not sure if I will have enough beads. I ordered five tubes of Toho Round Seed Beads 8/0 #88 'Metallic Cosmos' 8 Gram Tube, which at the lowest estimate (7 g per tube, 38 beads per gram) is 1330 beads. 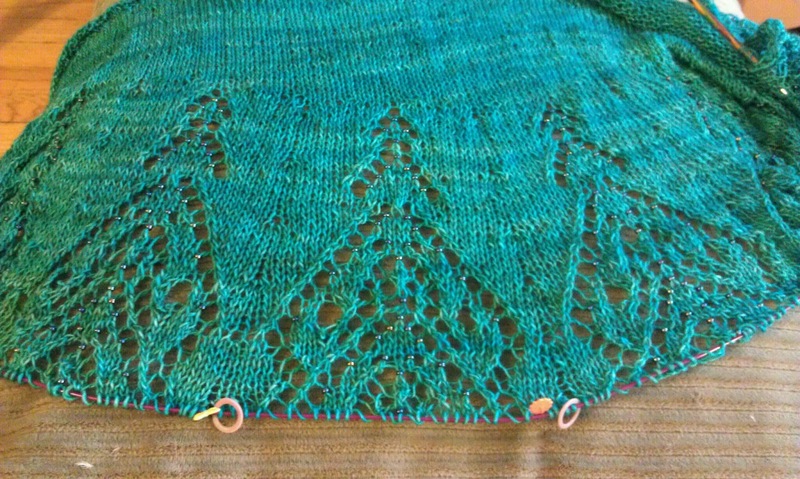 Since I am removing two repeats, this means that there are 86*2 fewer bead that I need to add to the shawl. Lucky me! 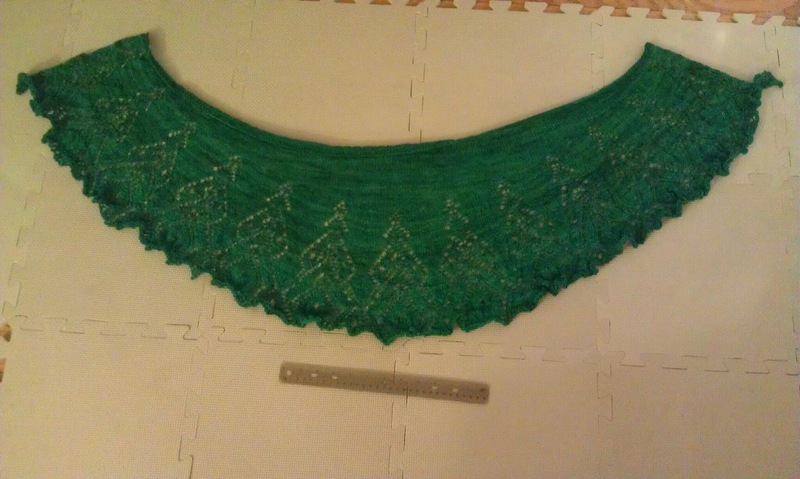 I knit the shawl on size 6 knitting needles. 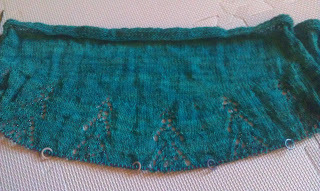 I used size 4 for the cast on and size 9 for the bind off, following the pattern instructions. I am SO grateful that the pattern makes it so easy for you to add or remove repeats in both the small and large sizes. I am going to make the large shawl, minus 2 repeats. 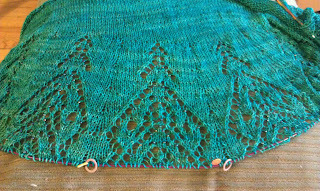 (256-17*2= 222 sts cast on) I used the cable cast on as suggested by the designer. Not only does this cast on method meet the firmness requirement, it is great when you want to conserve extra yarn because there is no long tail to calculate. I realized that I should check my gauge. I am so worried about yardage, why not make sure that my gauge is on target? 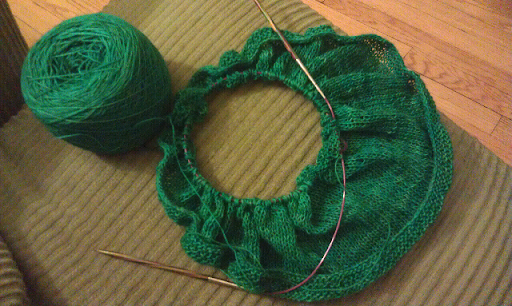 (Especially since this is the first time I've knit one of her designs with this yarn) 6 sts/inch unblocked. We're ready to roll! I LOVE the marker placement for the short rows. This is so much easier than keeping track of which stitch was wrapped or not. 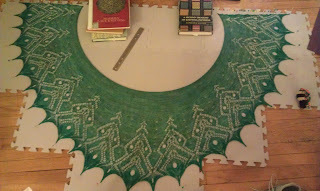 When this projected started (second week of Jan), I was working on the sample of my first shawl design. 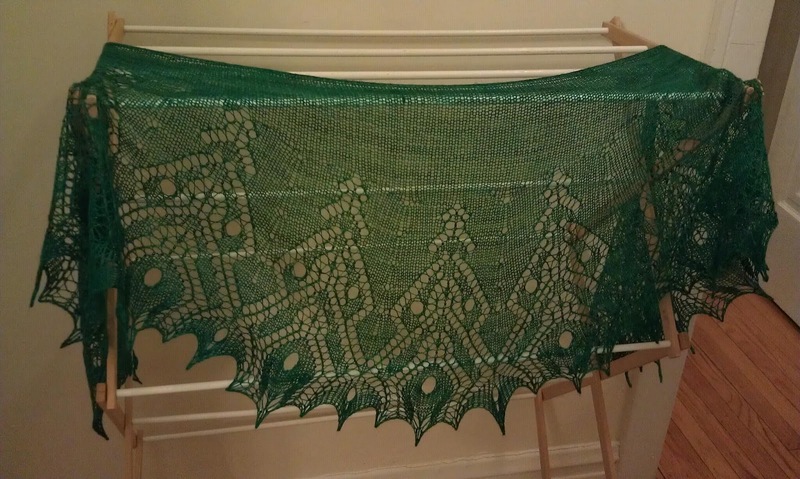 (Denise Shawl) I had figured that it would work nicely because the progress of a mystery KAL is fairly slow. What I didn't count on this biggest step being the first clue! Whoops, not too great for my timing. 107 g remaining after the short rows. 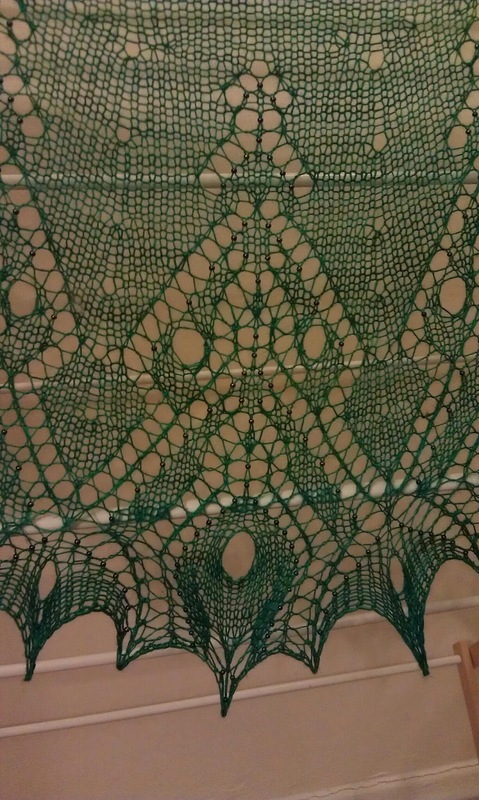 I realized (a bit too late for my part) that by removing 2 lace repeats I've reduced the number of rows at the middle of the shawl by 7. This is only about an inch of depth so it will hopefully not make too much of a difference. I can easily get 9" at the center if I pull. 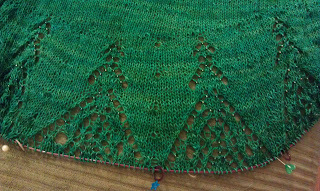 Unblocked this is deeper than my Polairs shawl at this point, so I'm feeling a lot better. This is my first time using a crochet hook to add beads. Sometimes I accidentally split the yarn, but I am getting the hang of it. 95 g remaining at the end of this clue. Clue 3 went quickly, but it was also shorter overall than clue 2. I am really enjoying working with this yarn, even with hooking a million beads! 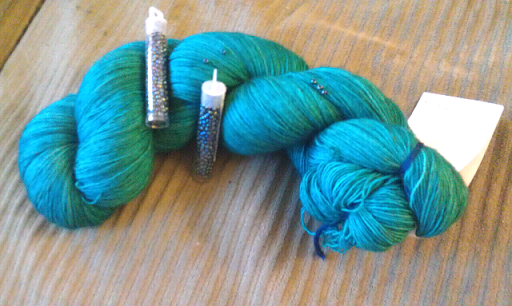 (By comparison, the yarn I'm using for my Mom's Polaris Shawl is not quite as pleasant to knit with.) 85 g remain after the clue. 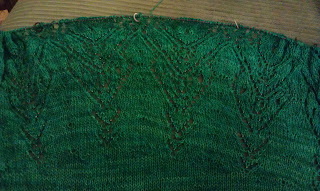 The lace is now getting more complicated. It is taking more focus to knit each row. I am really enjoying how this pattern is coming out. When I started this clue, I was still on the first tube of beads and then opened the second. There will be 86 beads used per repeat, and at this point we have only used about 30. I suppose it is possible that I severely underestimated the number of beads that I will require for this project, good thing I like the color! The only sad thing is that with my Advent Scarf project starting soon, I would have loved to use these same beads on that project. Since I would need to move the markers at the beginning of the next clue, I moved them during the last p round. 78 g remain after clue 4. 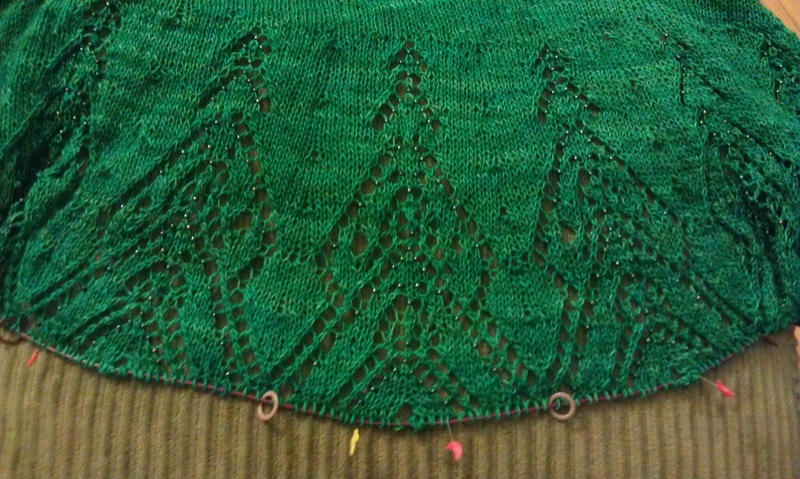 The shape is finally looking less Christmas Tree-y and more like a wonderful geometric shape. I love how there is almost a curve to the lines. I finished the second tube of beads near the beginning of row 57. Of course, I still have a few dozen beads that haven't been used but are too small to fit on the crochet hook. These technically would be usable if I were running low, but I am not. Oh well, I'd rather have too many beads than too few! I made sure to finish the last WS row this time around. I wonder if there is going to be 1 or 2 more clues after today. 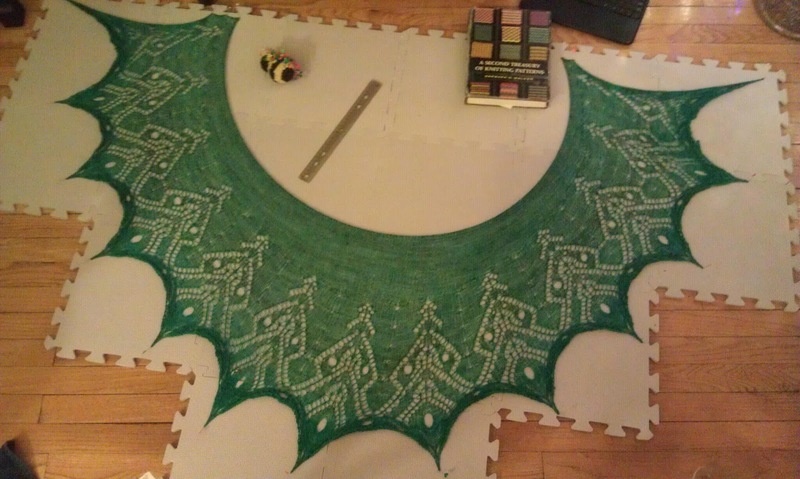 I am so excited to see how big this shawl ends up. 58 g remain at the end of the clue 6. Wahoo! I am so excited that this isn't the last clue. There are only 8 rows, but since I am still busy with the Advent calendar I wasn't able to start this clue until days after it came out anyway. Turns out, it was Sunday when I was able to start it... the day before Clue 8 was to come out. (But this was also the day that I finished the Advent Scarf... so much free time now!) When Clue 8 was released, I was only done with 2 rows of clue 7. 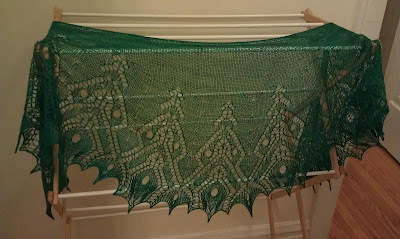 My staying on target stream is done, but it is my own fault for doing to mystery projects at the same time. I am overjoyed! The finishing instructions and blocking schematic won't be coming out until next week's update! This means that I still have some time to catch up. At the end of clue 7, 49 g remain. Towards the end of row 69, I finished the 3rd tube of beads and opened the 4th. I've been so exhausted that I've only been managing 1-2 rows a day. My hope was to finish this Sunday evening (Tonight - I currently have 1/2 p row, last beaded row and then binding off to finish) so then I would be all caught up for the last clue. No such luck... The last clue was released Sunday morning! In total I used just under 3.5 tubes (7-8 g each) of beads. Of course, there is about 1/3 of a tube that are beads that did not fit comfortably onto my 0.75 mm crochet hook. If I were concerned about running out of beads, I could have switched to the dental floss method to add these to the project. I found that the matte beads I used in my advent scarf had MANY more beads that fit onto the crochet hook even though they are the same size same brand. 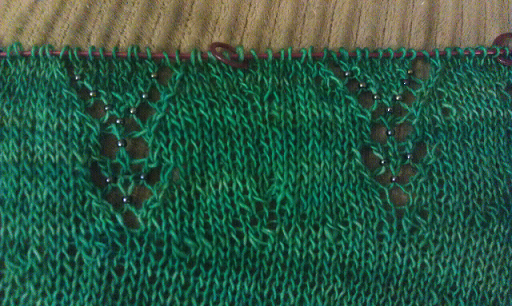 Something about the treatment of these beads must make the holes smaller. I think removing two repeats was the right decision. 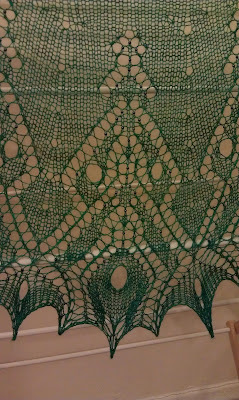 If I have had any complaints with (many) of the shawls I've knit... it is that they are too long and not deep enough. I think that I may have a winning size here! 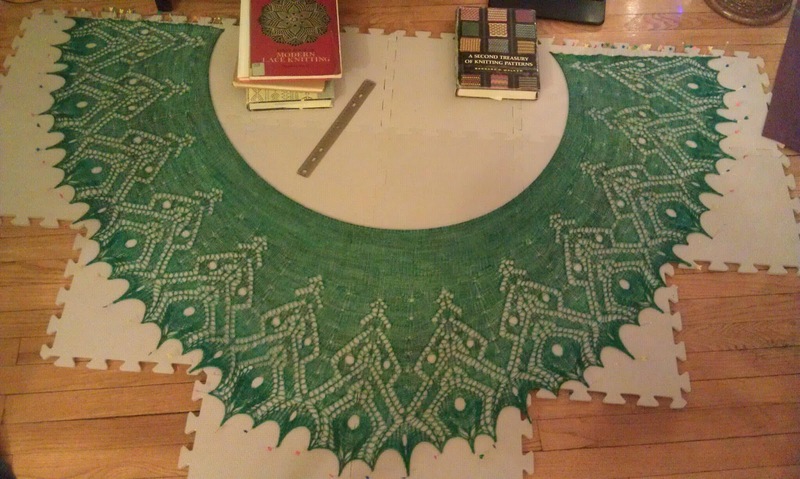 Ultimately, I think the size of this shawl is perfect and I cannot wait to wear it.